Ever since Kill Bill Vol. 1 and Kill Bill Vol. 2 hit theaters a few months apart in 2003 and 2004, fans have been clamoring for director Quentin Tarantino to revisit this beloved classic with Kill Bill: Vol. 3. While there are no official plans in the works for this long-awaited follow-up, the director recently told Variety, while doing press for The Hateful Eight, that he may in fact revisit his beloved character The Bride/Beatrix Kiddo (Uma Thurman) at some point in the future. Quentin Tarantino admitted that he wasn't always keen on the idea of going back for another sequel, but now he has changed his tune. "I've been very non-committal about it. I'm not committing to it, but I wouldn't be surprised if The Bride made one more appearance before the whole thing is said and done. I am talking to Uma (Thurman) about it just a little bit. Some of the stuff that I'd written that never made it into the movie that maybe I could use. I'm thinking now, 13 years later, what would be going on with Sofie Fatale? What would be going on with Elle Driver? The thing that does attract me to the idea, and I wasn't that attracted to it before, because I felt I said what I had to say, and I kind of liked the idea of Beatrix Kiddo living out the rest of her life in peace, to some some degree, I think Kill Bill is my most visionary movie. Not necessarily saying how good it is, but I think it's a very vision-oriented movie, and I create this world that doesn't exist. On planes, there's holders for your samurai sword. Since KillBill, my work has veered more towards the literary, and perhaps less on the visual, to one degree or another. I think, maybe a good helping of viscera would be a nice thing to happen, at least at some point in my future." The director added earlier this month that he wanted to give Beatrix some time with her daughter, and give her a lot of time to find peace, which would be reflected in real time, and is one of the reasons a sequel hasn't happened yet. This is all certainly good news for fans of this two-part action saga, since, just a few years ago, the director said he wasn't interested in exploring genres he's already tackled before. Perhaps he changed his mind after directing two Westerns in a row, with Django Unchained and The Hateful Eight, which is currently playing in theaters. While he stopped short of revealing any specific story details, there are a couple of possibilities that could be explored for Kill Bill 3. You may recall that, in Kill Bill Vol. 1, Vernita Green (Vivica A. 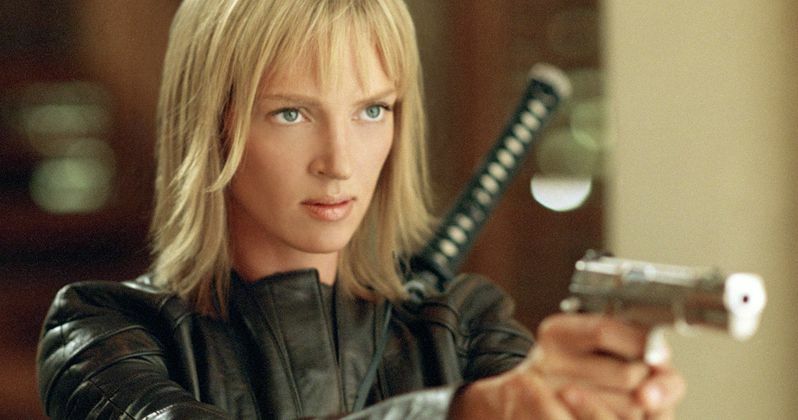 Fox) is the first target of Beatrix Kiddo (Uma Thurman). After a brutal fight at Vernita's home, Beatrix kills Vernita, in front of her young daughter, Nikki. Beatrix tells Nikki that if she ever wants revenge for the death of her mother, she'll be waiting. Quentin Tarantino hasn't announced what his follow-up to The Hateful Eight will be yet, and while it seems he could use discarded material from his original Kill Bill scripts, he doesn't have a full screenplay ready to go for Kill Bill: Vol. 3 quite yet. Do you think Kill Bill: Vol. 3 should be the filmmaker's next movie? Chime in with your thoughts, and take a look at the filmmaker's video interview below. Related: Kill Bill 3 Still Possible; What's Taking So Long?